You can change the importance of a patient's medical alerts (conditions and diseases) as needed. The importance determines how and where that alert appears. 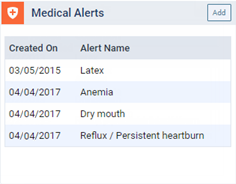 On a patient's Overview page, the Medical Alerts box displays any medical alerts that have been entered for the patient. Select a medical alert. 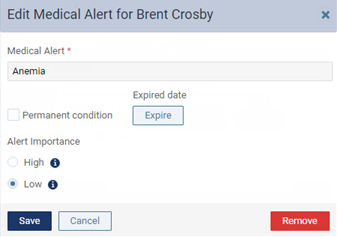 The Patient Information page opens with the Medical Alerts tab selected, and the Edit Medical Alert dialog box appears.